You know what's at the top of the "101 Things a Mom Doesn't Want to Hear on the First Day of School" list? Well, pretty much anything that comes directly from the principal, and especially anything that has to do with bus/car collisions. (For the record no one was hurt and Sky thought the extra time sitting on the bus was a great way to make new friends and "memorize the inside of the bus"). When Sky's principal called me just 90 minutes into the new school year, it didn't help my nerves. I mean, I was already a bit anxious for the kids --getting ready for a new school year takes mental, physical, and social work (as you probably remember from past posts here, here, and here). The new school supplies, shoes, and haircuts are the easy part. For Pink, a new school year means contacting the principal who puts me in touch with her new teacher so we can talk at length about the various contingencies necessary for avoiding unwanted peanut exposure in the classroom. It also means making a special trip to meet the school nurse to make sure she has all the appropriate paperwork and protocols in place. And, of course, these conversations force me to think realistically about all that could possibly go wrong with my severely allergic child in a school full of peanut butter eaters (okay, so they don't ALL eat peanut butter, but it sure feels like it when I start to think about what could happen if someone touches my kid with peanut butter on his/her hands). In case you're wondering, this is why I maintain a healthy sense of denial about Pink's allergies (while also keeping an epipen handy, of course.) The start of school means working through all of my anxieties about Pink's allergies. I get that forcing kids to eat their peanut butter at home is inconvenient and unfair, but it sure would help lower my stress level if they did. Meanwhile, for Sky preparing for the new school year is an ongoing process. Before the last school year ended, Sky worked through social stories with his speech therapist and visited his fourth-grade school building with a group of his peers. 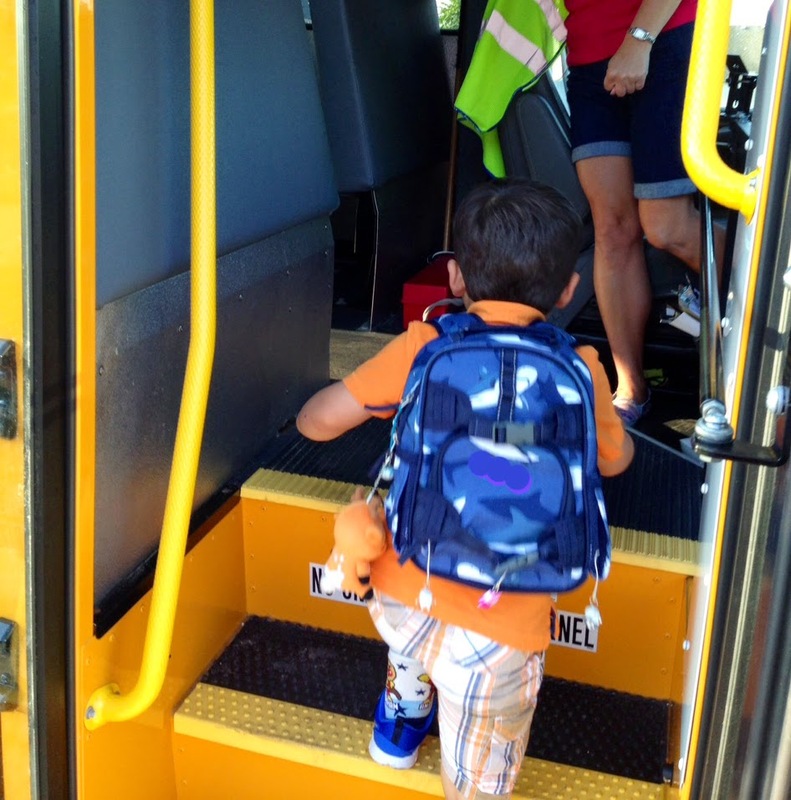 For weeks, we've talked about the new school building, his new teachers, the new principal, and his new bus route. We've brainstormed about what to do if kids are mean or call him weird. All summer (except for when we were in Japan), Sky had weekly hippotherapy and behavioral therapy sessions. Sky works ceaselessly to fit himself into the neurotypical world around him; sometimes his hard work pays off, and sometimes it doesn't. Every year, in the days before school starts, we set time aside for me and Sky to meet with Sky's new teacher. For a kid with difficulties processing social cues and transitioning into new environments, meeting with the teacher and talking about his concerns ahead of time always helps. It's different with each teacher, of course, but this year, Sky's new teacher met with him for nearly an hour, taking a break from her final preparations to tell him about the classroom, to answer his questions, and to help him start to understand the routines of fourth grade. We also established the best means of home-school communication and discussed how we would handle any concerns about his IEP, incidents of bullying, or any other issue that might arise (and believe me when I tell you there's no limit to the kinds of "issues" Sky can have in school). Sky left that meeting feeling excited and ready for fourth grade (and I left wondering how many other parents spend so much time with their kids' teachers before the first bell on the first day has even had a chance to ring). Believe it or not, the baby started preschool--the early childhood program at the local elementary school to be precise. I actually thought I'd handle this transition fine. I mean, Stow has been receiving therapies since he was 1, and the early childhood program in our town is known to be the best around. All of our transition and IEP meetings went great, and I am sure he's where he needs to be. In other words, I didn't do much of anything to prepare Stow for the first day (except get his haircut and buy him some shoes) because I knew he was ready. But, I didn't really realize that I wasn't. Not long after Sky and Pink's bus pulled away, Stow's little preschool one came. He climbed right on, plopped down in a seat and waited patiently for the driver to click his seat belt into place. 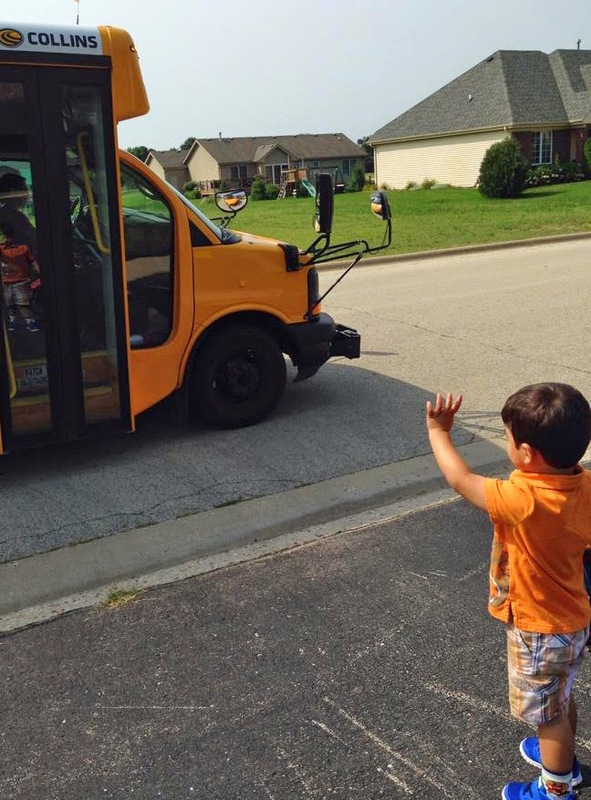 I don't know if he realized he was going alone (though I guess he probably did since he's seen his big brother and sister get on the bus hundreds of times), but I do know that he was grinning ear to ear as the bus pulled away. And, much to my surprise, I totally lost it. I am so NOT sentimental. I have no idea why I cried. I suppose it had something to do with the expression of eager anticipation on Stow's face as the bus drove away. My realization that my little guy who doesn't talk a lot was going off into the great big world on his own didn't help. Then, there was the realization that my baby isn't really a baby any more, and there's not a darn thing I can do to get a single minute back. Not one. See, my kids? My kids, they keep going out into the world. They don't let the allergies or the autism or the anxieties hold them back. They go out into the world dancing, laughing, and making the absolute most out of it. Letting them find their own way (without letting the fear of all that could go wrong consume me) is not easy, but I know it's my job to let them go. I'm still figuring out how to do that without it breaking a little piece of my heart every time they go. All I can do, really, is believe things are going to be okay, even if there is a fender bender or two along the way.